There are many provinces of Vietnam whose grounds—not so many years ago—were forever stained with the blood of American heroes from Georgia Military College. This Memorial Day weekend, we remember the GMC cadets who gave their lives to protect the values, the ideals, and the way of life that we cherish as Americans. Former cadets like Major Albert Peterson who was killed in action in 1971. Corporal Oscar Higginbotham whose sisters called him “Buster” and who was still a teenager when he made the ultimate sacrifice. Marine 1st Lieutenant Lawrence “Larry” Knuth who loved baseball, fast cars, and motorcycles and who was killed in ground combat in 1966. Sergeant Paul “Skip” Lawing, a green beret, a dog lover, and a great basketball player. He was posthumously awarded the Silver Star for gallantry in action. Skip’s beloved dog Sandbag made it home from Vietnam and attended his funeral. Lieutenant Colonel James “Ralph” Ethridge who was killed in a helicopter crash and was laid to rest less than 2 miles down the road from GMC at West View Cemetery. Sergeant Major James Emory Jones, an Army Special Forces soldier who is still listed as MIA but was reported by a witness as a likely casualty in a 360 degree ambush. A bridge now bears his name in his hometown of Alapha, GA. Specialist Johnny “The Fox” Wheeler, a Screaming Eagle from the 101st Airborne’s 327th Infantry, who was a singer and guitar player with a thick Georgia accent. Johnny was killed on his 27th birthday when he crawled into enemy fire to save his wounded Lieutenant. America would be lost without Soldiers like these. Soldiers who serve as if America’s future and the freedom of her people depended upon them alone—with courage, with dedication, with honor. GMC is so proud of their service, and remembers and honors their sacrifice. This Memorial Day, we remember them, and every GMC cadet and all of our nation’s fallen heroes who bravely gave their last full measure of devotion. As we head into Memorial Day weekend, may we all take time to reflect on the immense sacrifice these Soldiers and others have made. ​Please help us remember GMC&apos;s Vietnam War heroes by joining us in supporting a special tribute to them, the Vietnam Veterans Scholarship Fund. Your giving in memory of these heroes provides a gateway to brighter futures for thousands of students. 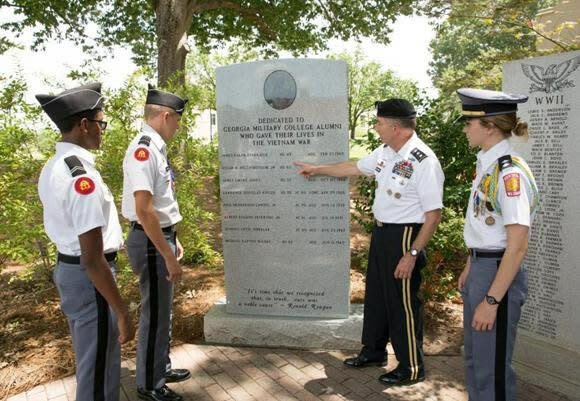 At the GMC Memorial Garden, LtGen William Caldwell shares about the sacrifices that former GMC Prep Cadets have made in service to our Nation to Battalion Commander Allie Kauzlarich, Cadet Malcolm Clayton, and Cadet Walker McDade.